Cancer cells mediate their responses to both internal and external stimuli through enzymes like GSK-3. Finding new potential therapeutic targets in these pathways is at the core of many cancer research efforts, including several at the Broad Institute and its partner institutions. The GSK-3 enzyme exists in two unique versions, alpha (α) and beta (β), each having unique functions. In a paper published in the early online edition of the Journal of Clinical Investigation (JCI), researchers at the Broad Institute and elsewhere provide new information that GSK-3α is an essential member of a signaling pathway involved in acute myeloid leukemia (AML). 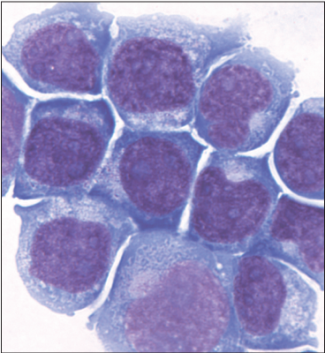 AML is a result of abnormal blood cell development. Early-stage cells fail to differentiate normally into healthy cells. The result is a build-up of excess white cells in bone marrow and a dearth of healthy, functioning blood cells. “AML cells show a propensity to proliferate and a failure to listen to normal signals to die,” explains Kimberly Stegmaier, a Broad associate member, pediatric oncologist at Children’s Hospital Boston, and principal investigator in pediatric oncology at Dana-Farber Cancer Institute who led the study. Stegmaier sought to find the underlying causes of the differentiation defect seen in AML with the goal of identifying both new protein targets and small molecules capable of inducing differentiation in AML cells. Stegmaier has led a number of collaborative projects at the Broad aimed at finding new AML targets. In 2009, she and her colleagues identified a role for Syk, another protein kinase, in promoting AML differentiation. This approach included three high-throughput screens that allowed Stegmaier to pinpoint a role for GSK-3α in AML. The first two were chemical screens done in partnership with Nicola Tolliday, manager of screening outreach in the Broad’s Chemical Biology Platform. In a high-throughput manner, Stegmaier and Tolliday screened for compounds that promoted AML differentiation. “This approach enabled us to measure whether a gene expression fingerprint of maturation was induced in the AML cells when they were perturbed by each of the small molecules,” Stegmaier adds. The first proof-of-concept screen proved the approach to be technically feasible. Over time, the chemical screening effort grew more sophisticated and inclusive. Initially only able to measure the effects on a handful of genes, the team can now measure the effects on hundreds of genes. And the throughput improved as well. “We started by evaluating ~ 1,500 compounds, and now we are able to look at tens of thousands of compounds in one screen,” Stegmaier says. This required significant computational analysis of large sets, led by Kenneth Ross, senior computational analyst in the Broad’s Chemical Biology Program. From these results, the team was able to conclude that the compounds promoting differentiation in the chemical screens were GSK-3 inhibitors. She next teamed with researchers in the Broad’s RNAi Platform, as well as associate member William Hahn and Anna Schinzel, to determine if AML differentiation could be induced when individual genes were turned off. “We saw that when we suppressed GSK-3α specifically, AML differentiation was promoted.” If GSK-3 alpha was shut down, so was AML. The paper provides another layer of detail about GSK-3 biology and signaling. Nearly all of the GSK-3 inhibitors available today target both the alpha and beta subtypes. But, when both are targeted, a protein called β-catenin, which is involved in promoting AML stem cells, becomes active. Stegmaier learned that suppression of GSK-3α does not have this effect. This suggests an alternative therapeutic approach using compounds that only target GSK-3α. That is just one of the next steps Broad researchers and collaborators are taking to learn more about this new disease target. Banerji V et al.,The intersection of genetic and chemical genomic screens identifies GSK-3α as a target in human acute myeloid leukemia. February 13, 2012, The Journal of Clinical Investigation, DOI: 110.1172/JCI46465.